The goristro here looks pretty badass. 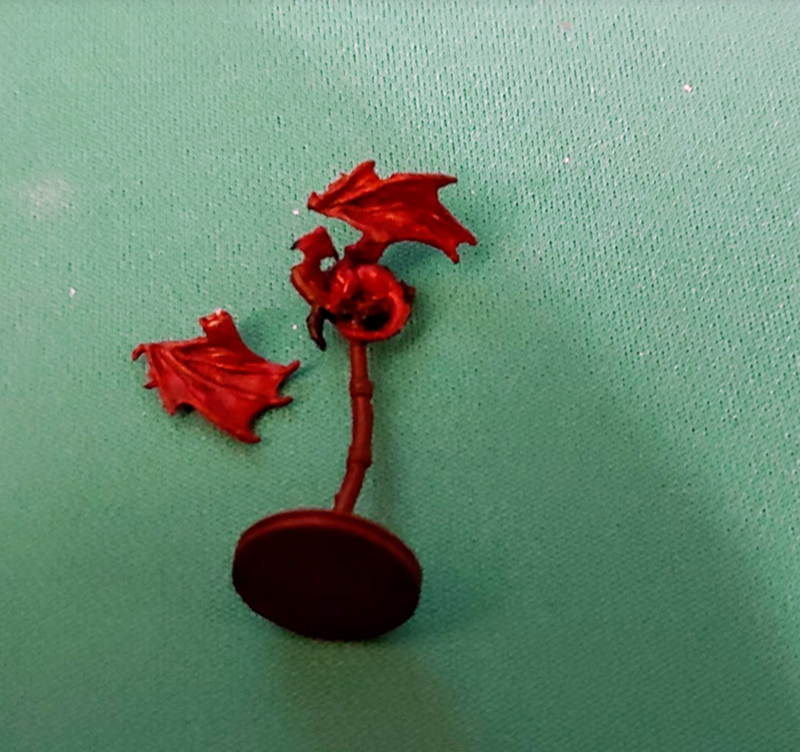 Like most of wizkids minis the paint job is lacking. It’s pretty much mostly a flat color with a wash, but it’ll do. Just picked up a couple of treats at my FLGS! The booster boxes yielded some okay minis and a pair of big baddies that will definitely come in handy. FROGHEMOTH! Great sculpt! Paint job is flat green, barely any wash, but I might touch it up with a bit of dry brushing. It’s a great mini! Okay, tackling the Halaster’s Lab set! Pulling it out of the box is impressive – lots of pieces to unpack. They’re pretty snug, be careful pulling them out of their slots. This piece I pulled out first. Looks like the hand and eye of Vecna, on a plush pillow with a glass dome. Unfortunately the dome is slightly off-center and foggy, obscuring the details. But my pseudodragon on a perch has a broken wing right out of the box. Going to be a difficult fix due to the tiny contact point. Some desiccated corpses that I can’t help but giggle at because they look like they’re dancing here. Also super reusable. Now this is a nice piece with lots of details! A table full of stuff! 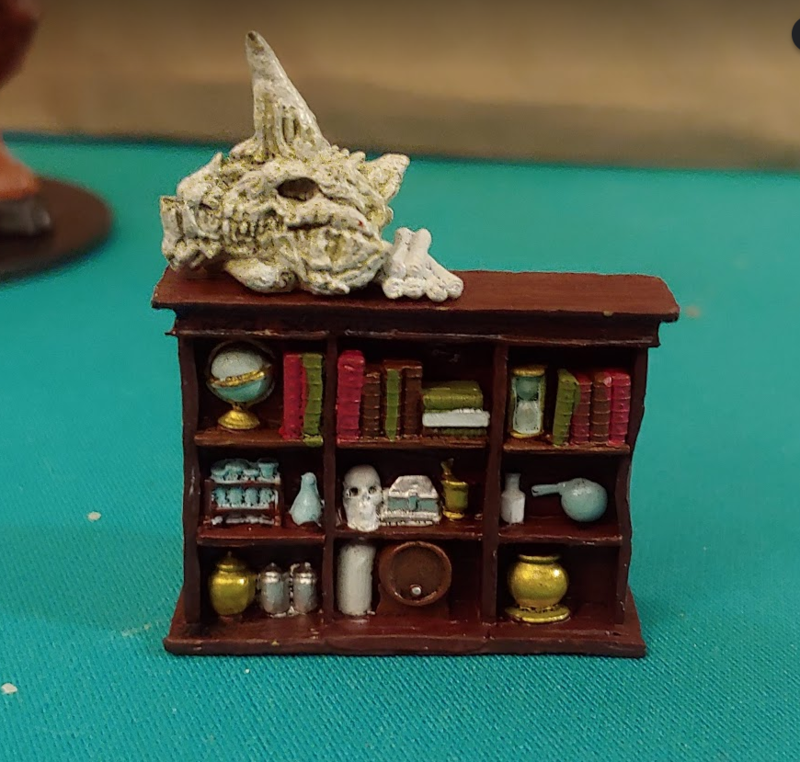 There’s a small locked box, vials, candlestick, assorted jars, book w/ quill pen, mortar & pestle, scroll, another skull, gold goblet, and some more books & scrolls. When your party loots all of this, you can swap it for the empty table. Halaster has more books than shelves apparently. That summons a helpful demon hand! Well this piece was sort of disappointing. 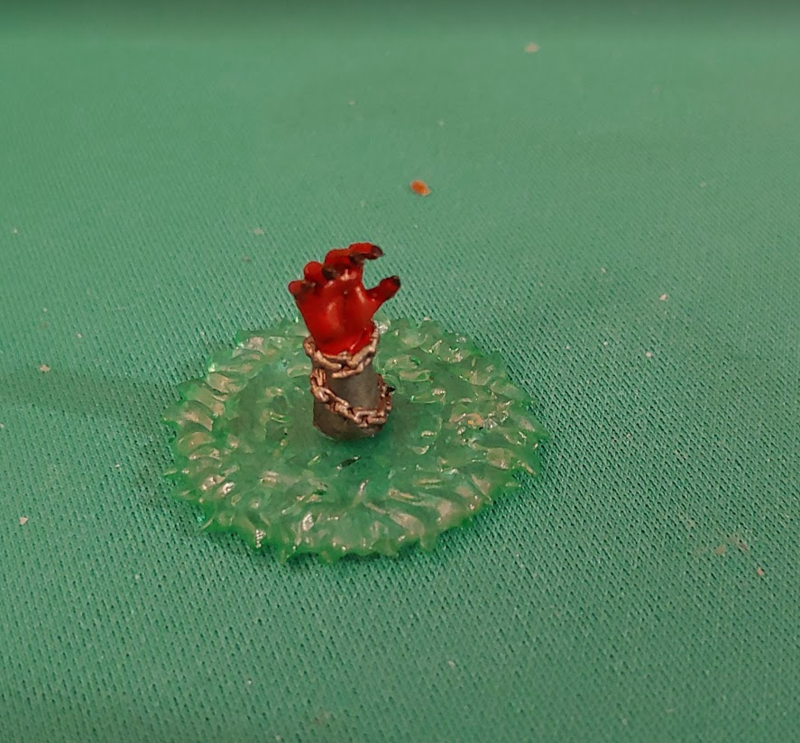 It’s 1.5 inches tall but the “sand” is painted, as seen here upside-down. It is large enough, and I have seen some really tiny sand timers, if this had been a functional sandglass, that would have really knocked this set out of the park. Maybe I can buy a tiny timer myself and modify it. Fabulous looking when open! Halaster is a real trendsetter. For the sake of a good time! And give me a hand this time? Dedicated to all the wonderful people I gamed with in 2014. Here’s to good luck and good gaming in the New Year! This is Part 1 of 2 about coordinating organized play for D&D Adventurers League. Sifting the wheat from the chaff. Culling the herd. Not letting a bad apple spoil the barrel. There are different ways to say it, different ways to think about it. It’s the reason why we have a Code of Conduct. There are bad players out there. At my store, we learned quickly how bad players influence new players and how to act on and remove such negative influences promptly to ensure the overall health of our organized play program. We expect a lot of turn-over in Encounters. It’s an informal event as organized play goes and people join and leave all the time, but as we monitored attendance and informally polled players about their play experiences my husband, who is a very good reader of people, would pick up a pattern every season or so. Brand new players seated at a certain table would not stay more than one or two weeks. We’d observe that table and find one player was disruptive or rude to the other players. Or we’d actually receive complaints if the player’s actions were especially obnoxious. This would make new players uncomfortable or disinterested. In some cases the new players would be the target of the rude player’s attention and that would only hastened the leaving process. We immediately began intercepting these problems and trying to deal with them. I’ve seen the idea circulate that because this is public play everyone has a right to play, so we coordinators should do everything to find a workable compromise for every player that comes to our store. Not true. Any compromise that allows a bad player to stay and a good player to leave is a bad compromise. Everyone has the right to have fun and if a player is not contributing towards that goal, they forfeit their right to be part of a fun event. Those of us running D&D Encounters are volunteers. We are donating our time to make this event awesome and we do not have to tolerate it. It seems like common sense, but we’ve seen the questions on forums or answered them at panels. “How do I deal with X type of roleplaying?” where X is not a type of roleplaying at all, but some disguised flavor of disruptive behavior. No, there is no obligation to accept “Its what my character would do” as an excuse. In fact, its a red flag for malicious PvPing in most cases I’ve witnessed. Another example is “What should I do about this player?” where the player mentioned has demonstrated continued bad behavior. Some gamers believe they should try to tolerate these people, to find some way to make them better, to try to “fix” them, or at the very least find a coping mechanism. Ain’t nobody got time for that! D&D Adventurers League is not Roleplayer’s Rehab. Cut out the bad apple and focus on the present players and the new players. If one new player’s experience is ruined by a bad player, think about what you’ve really done for them: their first memory of their first D&D game will be the bitter memory of something uncomfortable, uninteresting, and/or unsatisfactory. Don’t facilitate that. Trim the rot and help the good grow! Addressing Problem Players: Ask. Warn. Remove. Ask them to stop first. Discuss the problem but stay firm. Remember that intentions are unverifiable and are almost completely irrelevant to the consequences. Anyone can lie to you about why they did it. It really isn’t about why but about the what and the fact is they did it, and the outcome was negative. Warn them of removal second. Step one you could be open to discussion, but in Step two accept no negotiation. They have violated their social contract by breaking the rules a second time. Be polite but precise in your expectations. The behavior must stop or they will be excluded from the game. Remove. Three strikes, you’re out. The player demonstrates they’re either incapable or unwilling to alter their behavior. Here’s your litmus test: would WotC approve of this behavior? Would they proudly put this behavior forward as an example of what D&D is to someone who has never played D&D? If the answer is “No”, hell if the answer is “maybe not”, consider cutting the bad player lose and dust off your hands without regret. You can skip to any step as you deem appropriate based on the severity of the ill behavior. Don’t tolerate cheaters. Don’t tolerate threats or violent behavior. Don’t tolerate bad hygiene – soap is cheap. Most of all don’t tolerate bullies or creepers. Remove the player and suspend them from playing in your program. Suspend a bad player for an amount of time proportionate to the crime. Suspension times can be a week, a month, a season, or forever. If cutting bad players seems to be a bad idea because it will decrease the number of players to an insufficient amount, consider this: how will you make room for new players if the seats are filled with bad players? Better still, bringing in a new player means bringing in someone with no bad habits, no misconception about how to play. Cultivating new players into Great Players is a lot easier without any bad influences around. Yesterday we all saw the announcement from Wizards regarding the D&D Adventure League, which was very interesting. As my husband and I manage the Organized Play at our FLGS, any new developments in the Organized Play program affect us deeply. After reading it, I’ll admit I was a little excited. The indication of something akin to a “living campaign” with material for higher level play is very encouraging. Encounters sees a lot of turn-over in its players. Partly because players naturally bond and move on to form their own home groups, but also partly because Encounters perpetually cycles players through the first levels of play, which gets dull after a while. Players crave more challenging games. The previous link about D&D Adventure League is a lot of fluff, but this link has some interesting insights to be gleaned. This is great. Traditionally 1 kit = 2 tables. That’s fine for most stores, but my FLGS’ Wednesday Encounters last night hosted 5 tables of 7 people each! We received 2 packets from WotC this season, but thankfully now all my DMs can have their own PDF of the module instead of sharing a hardcopy. Additionally, if a single packet now supports 4 tables, that means smaller stores, which would normally get a single packet worth 2 tables, will be able to more easily encourage a third or fourth table if they so wish. Beyond the general Encounters info, this part is intriguing. I’m going to be interested in seeing how often these “Expeditions” are released. I can’t help but think that for areas that don’t have a lot convention events, stores will be able to run these as Game Day events or perhaps routinely, much like the old Lair Assault program, for more dedicated players (but with more roleplaying). The ICv2 link doesn’t mention D&D Epics at all, but Wizards says those will be the big convention events. Our first D&D Epics adventure will take place at Gen Con Indy this year. Entitled Corruption in Kryptgarden, it will be a massive, multi-table event that will shape the Tyranny of Dragons story and bring renown to those that experience it. Wish I could be there for it!